Some people say they don’t like a movie because the concept of it is exactly the same as another movie. The Hunger Games, for example, has been called a ripoff of Battle Royale. But to me, it’s not so simple. You can’t judge something just from its concept. 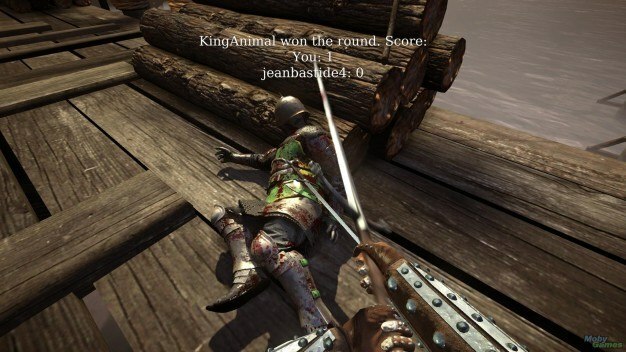 That’s something to keep in mind with Torn Banner Studios’ Chivalry: Medieval Warfare as well. The concept of a multiplayer first person shooter converted into a sword fighting is great, and not something that’s been done much before. But just as you can like a movie with a rehashed concept, you can dislike a game with an original concept. And frankly, though it is a good start, this one left a lot to be desired. 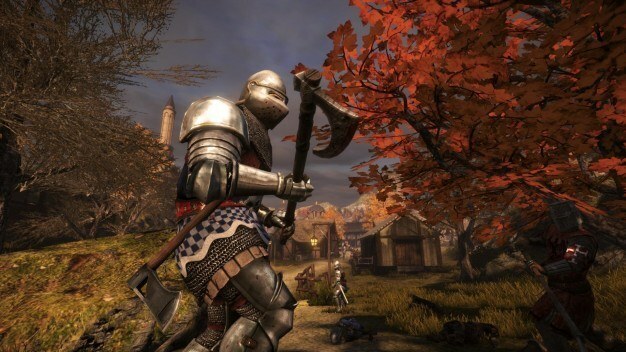 Chivalry works much like any online FPS. You select a game mode, a faction, and a class. The game modes are pretty standard: deathmatch, team deathmatch, capture the flag, and so on. There are two factions that add a little bit of story to the proceedings, just like in Titanfall. There are four classes: an archer, a typical soldier, a heavily armed soldier, and a soldier focused on polearms. Each has three different weapons, including one ranged weapon. The heavily armed soldier is of course very slow, both in movement and attacks, to the point that it can be rather frustrating. However, heavy armor can be extremely useful, so if you’re patient, it might still be a good choice. As most combat is up close, the archer has a bid of a disadvantage. Still, I didn’t find any of the classes to be unusable. From there, you battle in one of a few different stages. Melee weapons have three different types of attacks, and you can block as well. It’s rather strange that you can’t hold your guard; you have to get the timing just right. Overall, though, combat is as you’d expect it to be. A match supports 12 players at a time, so each faction in a team match has 6. You might have spotted the problem with this: 6 vs 6 is a tiny battle. The stages are big enough that often you’ll go for several minutes before you even see an opponent. If there were actually 12 people playing it might have been better, but the most I could ever find was 6. It was so sparse that I’m tempted to forgive the teammate who kept killing me; he was probably just bored. The game is meant to feel like an epic medieval battle, but it’s hard to get that feeling when there are only 12 people involved, let alone 6 or fewer. Spending all of that time by myself on the battlefield, I noticed another major problem: there is a serious lack of polish in this game. There’s usually no music playing during a battle; it started in the last couple of minutes of one match, but other than that, nothing. The sound effects are decent enough, but there’s not enough going on for them to suffice alone. I assume there was supposed to be music and this was just a glitch, but it was very noticeable either way. I also found that character animations can look very robotic, especially from a first person perspective. When you jump, your character’s arms lock up in a strange way, with no fluid motion. The graphics suffer from this lack of polish as well; they aren’t terrible for the Xbox 360, but it seems like more could have been done with them. For example, in the training mode, someone speaks, but his mouth doesn’t move. Little things like this aren’t major problems, but together they make the game feel rushed. Some might be surprised by what I’ve said, because the game has generally been very well received. And I can understand that, because there is definitely a good game hidden behind all of these problems. The concept is excellent, the swordplay works fairy well, and the game works fine on a technical level. 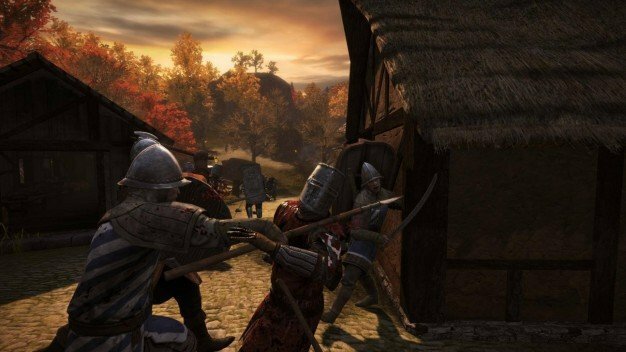 If these multiplayer online first person shooters are your thing, Chivalry might be a great game for you if you can look past its faults. Still, though, there’s one overall issue that I can’t ignore: the game is boring. The battlefields are bland, the characters are generic, and the gameplay doesn’t offer enough variety. A melee-based game doesn’t offer the same options as a gun-based game, and even the ballistas and other stage weapons aren’t enough to fix it. If the gameplay was a bit more precise, you might be able to strategize with the different types of weapons. As it stands, there’s just a lot of flailing around. I do want to give the game credit in one area: there are bots. Online-only games such as Titanfall force you to play online right away, so you don’t have much of a chance to practice. You’re thrown into matches with more experienced players, and you’re out of luck. Maybe this is the key to Chivalry; maybe with enough practice, you can pick up on the subtleties of combat. That doesn’t help, though, if the game gives you no reason to want to. Chivalry is the shell of a great game. The surface level is a dream come true. It’s only when you examine it in more detail that you see the cracks and the empty center.